Welcome to Brooklyn - modern luxury living! Come experience Brooklyn's diverse, cultural neighborhood close to various performing arts and entertainment venues such as BAM, Barclays, Kings Theatre and Prospect Park Bandshell. Near to the historic Prospect Park, Brooklyn Museum, Brooklyn Botanical Garden, Brooklyn Zoo, Manhattan and Brooklyn Bridges, and Fort Greene Park. Educational institutions in the area are: LIU-Brooklyn Campus, St. Francis College, St. Josephs College, Brooklyn Law School, NYU Tandon School of Engineering, and New York City College of Technology. Less than 20 minute train commute to Manhattan and various bus routes. This property hosts studios, one bedrooms, and two bedrooms with several different layouts to choose from. Homes created with top-of-the-line finishes, white oak floors, floor-to-ceiling windows, chefs kitchens, stainless steel appliances, quartz kitchen countertops, and amazing natural sunlight. Heat and hot water included! Building features an elevator, smoke-fee, 24-Concierge, Virtual Doorman, bike room, garage parking, laundry in building, live-in Super, package room, media room, resident lounge, HomeWork: Co-Working Space, pet grooming space, landscape roof decks with BBQ grills, beautiful city views, and so much more. 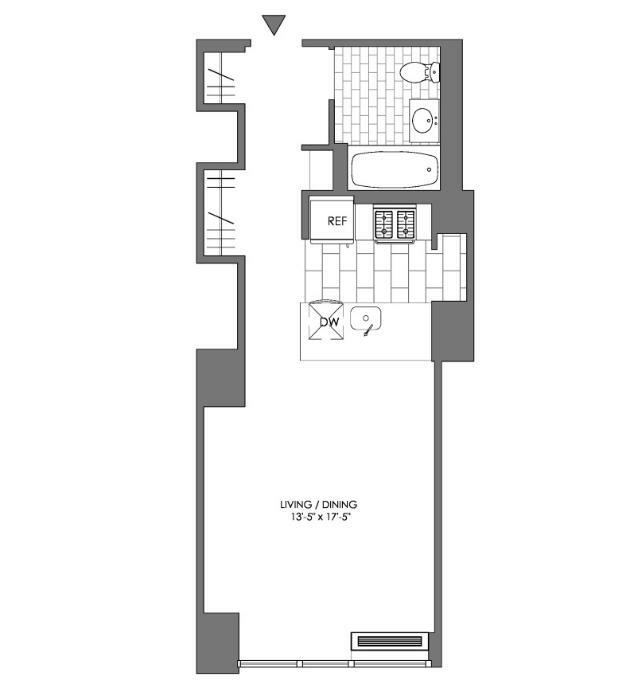 This apartment features: Stunning Northwest-facing Studio with a Beautiful Open Kitchen, Pantry Spacious Living Area and Ample Closet Space.